Lakers-Mavericks: Why Haven’t They Played More In The Playoffs. An interesting stat came to mind as the Lakers/Mavs series is set to start. Kobe and Dirk have never played each other in the playoffs. The table below tries to find out if this quirky stat is because they just missed playing each other in some years or because they weren’t on track to play each other. The table assumes that the Western Conference Playoffs go chalk, or all the higher seeds win their series. An example of how the chart works is: If the playoffs went according to the seeding, the Lakers should have played Denver 3 times, but only played them twice. I think the real interesting stat is not that the Lakers and Mavs haven’t played each other in the playoffs during the Kobe-Dirk era, but that they were only expected to play once in the 9 times that they have been in the playoffs together. No other Western Conference team had as many common playoff appearances with Lakers, with as few expected matchups with the Lakers. I constructed this graph to find out how long eras last in the NBA; and to find out the general state of the league, is it young or old. I’m counting an era as a period of time when a certain group of stars dominated the league. The 30-year sample size is somewhat small, but it still gives good insight. The chart works like this: if the average age is increasing from year to year, then a lot the same guys are probably in the top ten in scoring, and at the very least the leading scorers in the league are getting older. That means that the players coming into the league are not closing the talent gap with the older players as they age and/or the older players are aging well. Take a look the period from 1987-88 to1996-97 where the drafts were not as strong as the late 90s and early 2000s, and the older guys were all-time greats like Jordan, Barkley, Magic, Bird, Olajuwon, Ewing, Robinson, Drexler, Malone, Stockton, among others. The period from 2002-05 was one where the stars were getting younger; that is remarkable considering people don’t get younger. 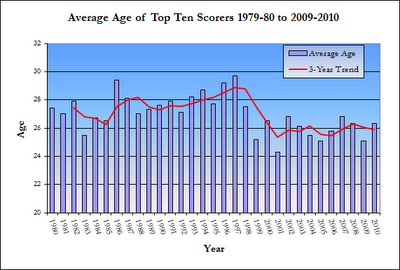 That means during that time period new, younger guys were finishing in the top ten in scoring for 4 seasons straight. That was a time when young guys like Carmelo, Lebron, Wade, and Bosh came into the league and old guys like Karl Malone were fading. That “era” lasted three seasons before players like Kevin Durant joined the leader scorer ranks. 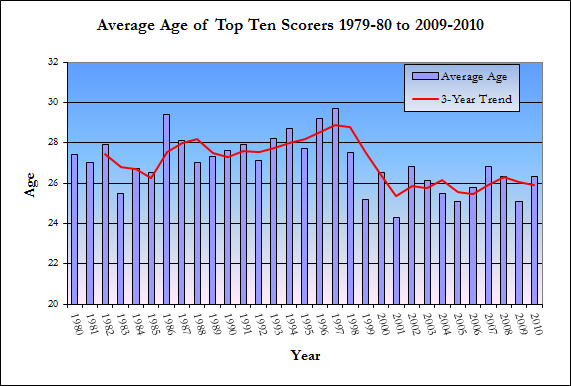 The bottom line is that when the average age of the top ten scorers is increasing, the league’s stars are getting older and not being replaced fast enough by the incoming young players. When the average age is decreasing, the older guys are retiring and declining while the stars coming in are younger than past years and making almost immediate impact when they get to the league. The league’s best players, with the exception of Kobe Bryant, are at the beginning or middle of their prime. Rose, James, Wade, Durant, D. Howard, Carmelo and I know I’m forgetting someone. I think another era like the late 80s to the mid 90s is starting to shape up, with the best players being so young and the draft pool for the next couple of years being as weak as I’ve ever seen it. How does Kobe’s game change when he plays against his closest peers, Lebron James and Dwyane Wade? The table above attempts to answer the question, and all stats are on a per 36 minute basis. I’ll start with Wade. Kobe is record is 7-7 against Wade; Kobe takes almost two shots less per game, and when playing against Wade his field goal percentage barely changes. His rebounds decrease by 1.6 and assists and steals don’t really change much. It seems that Kobe plays a less aggressive game when he plays Wade; the rebounding and shot taking numbers are evidence of that. A plausible reason could be that he guards Wade for much of the game and becomes slightly less effective in the other parts of his game. Kobe is 5-9 against Lebron in their head-to-head match-ups. It seems that Kobe puts more effort into the Lebron games than in the Wade games. His field goal attempts increase slightly, but he is less effective. His FG% against Lebron is .410 vs .456 against the rest of the league. Even though he takes fewer three pointers against Lebron’s teams, his two-point field goal attempts seem to be either long-range shots or high degree of difficulty shots. His FG% on two point shots is .446 against Lebron and .491 against the rest of the league; a big difference. The numbers seem to indicate that Kobe plays with more aggression against Lebron, but as it seems most times when Kobe is extra aggressive, he forces the issue and doesn’t play at his most efficient level. Kobe’s Shot Selection, Driving Ability, and Shooting Ability Compared to MJ, Bron, and D-Wade. The tables above represent the ten best and ten worst 2-point shooting percentages among Kobe, MJ, Bron, and Wade. I am using 2-point shooting percentage as a crude proxy for Shot Selection, Driving Ability, and Shooting Ability and it holds up pretty well. First, a look at the top ten table. Five of the ten were Michael Jordan’s prime years when his shooting ability and shot selection were improving and he still had incredible driving ability. Four of the ten were Lebron; his driving ability overwhelmingly overshadows his suspect jump shooting and average to above average jump-shot selection. The remaining one was D-Wade of 2010-11. No surprise there; Lebron helps Wade’s shot quality immensely with the attention he draws. Notice no Kobe in the top ten. Now for the more interesting bottom ten. Bryant has five of the bottom ten seasons; his poor shot selection has overshadowed his great driving ability and good mid-range game. All the rest of the bottom ten, including Kobe’s first two years in the league, are a result of youth, rustiness, or old age. Lebron’s rookie year is on this list because he had no jump-shot at all and typical rookie shot selection. Kobe’s first two years are this list because he has always had poor shot selection; combine that with a still-developing jump-shot and you have a poor 2-point shooting percentage. Jordan’s seasons on this list are pretty obvious too. You have his second year in the league, his comeback year in 1994-95, and his Wizards years of 2001-03. His comeback years were marred by his still good, but declining jump-shot and his almost non-existent driving ability when he was with the Wizards. In this stat, Kobe does not compare favorably with these guys, but I would still choose him over Lebron and Wade. 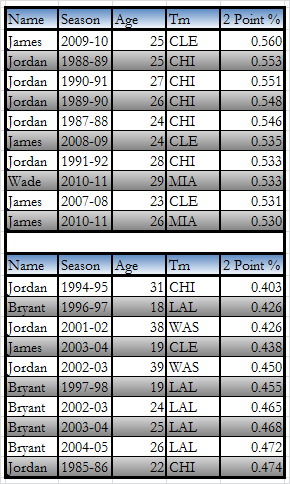 The adjacent tables represent the ten best and ten worst 2-point shooting percentages among Kobe, MJ, Bron, and Wade. I am using 2-point shooting percentage as a crude proxy for Shot Selection, Driving Ability, and Shooting Ability and it holds up pretty well.